When I was a kid my favorite ornaments were Richard Scary color it in yourself ornaments. Some were colored, some had a single line of crayon through them. they were paper cut outs with holes punched in them and ribbon, string or wire from bread bag attaching them to the tree. I love holidays as an excuse for crafts. There’s something special about learning how to make popcorn strings or fold crepe paper into streamers. There is a pleasure in making, mastering and being part of a communal effort that is seen. 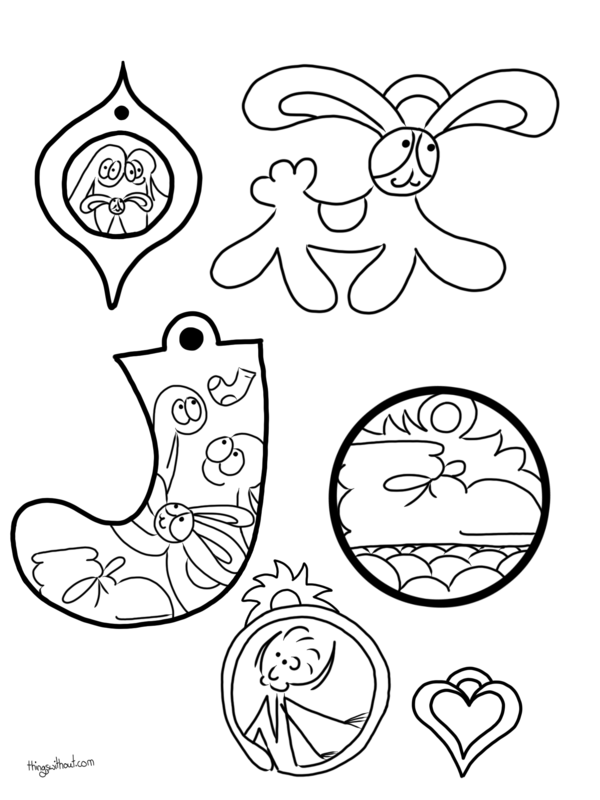 I made these ornaments for you, just print them out, color in, cut out and add string. If you do use any I’d love to see them. You can mention in the comments or send me an e-mail. I’ve printed out a copy for myself, but I have not yet colored mine in! The Things can be any color or pattern in the world (or non-world) so it’s hard to decide how to do it! I miss those bottle tops! Gold was definitely full cream and unhomogenized in Canberra. Delicious delicious cream floating at that top.